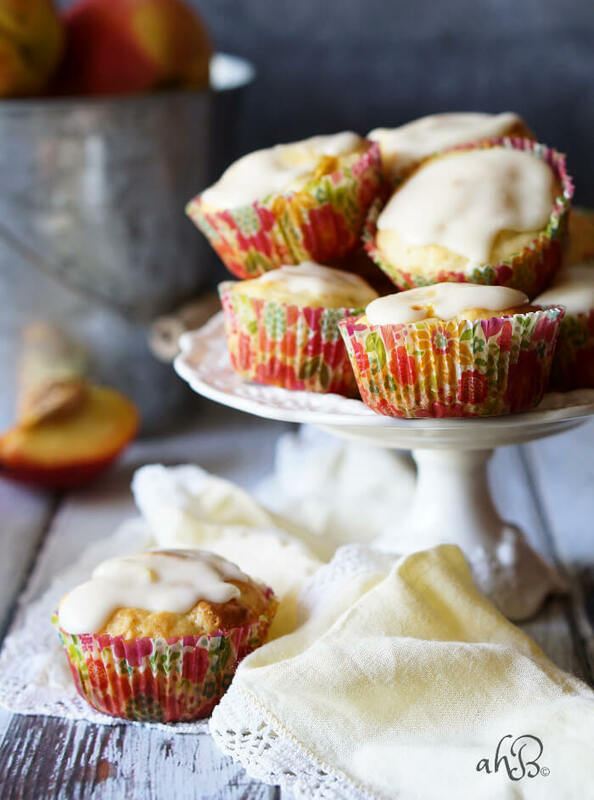 These peaches and cream muffins are full of baked peach and topped with a creamy vanilla glaze. 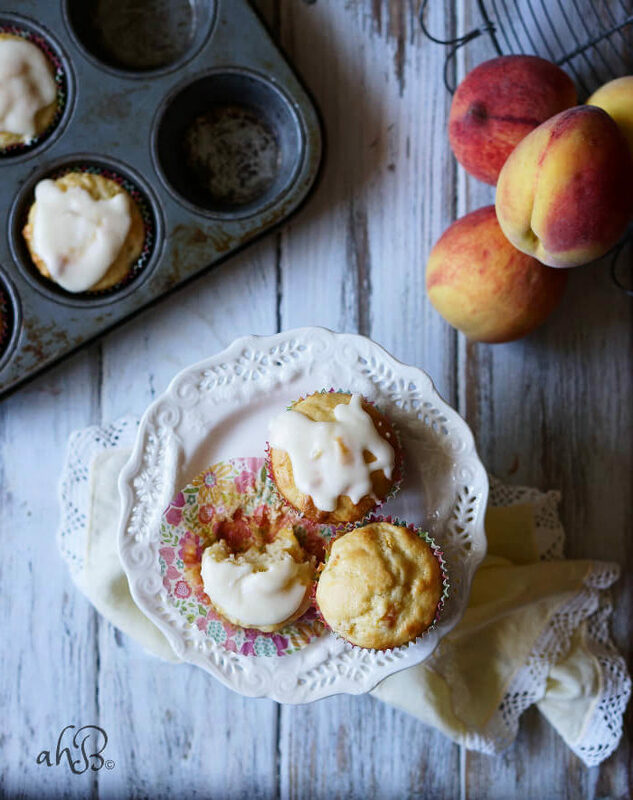 With a cup of fresh chopped peaches inside and also peach Greek yogurt, these muffins have that summery flavor you’re looking for. Tomorrow is a holiday. What holiday is that, you might be wondering? It’s a holiday that is so exciting I feel like shouting from the rooftops, and I’m sure that there are some teachers who would join in with me with my whooping. It’s the last day of summer school! Do you know what this means? It means that I am finally going to get the chance to sleep in. I am so looking forward to this. However, I’m slightly worried the parental branch of Murphy’s law might kick in and once the opportunity is here for the taking I’ll suddenly turn into an early bird unable to sleep past 6:30 am. Because that’s the way it usually works. Am I right or am I right? To celebrate the importance of this beautiful day, I baked up a batch of these peaches and cream muffins. These are literally sitting on my kitchen table right now, just waiting to ring in our last morning of summer school drop-off. To be honest I would have baked these muffins even if it was just to celebrate Wednesday, because fresh preaches and cream is a glorious thing. But today I get to say it’s because summer school’s out in just a few hours. Woohoo. 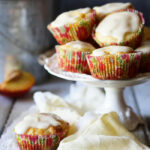 These peaches and cream muffins are pretty dandy. Almost every bite has fresh baked peach inside, with a stunning texture, light and moist that comes from Greek yogurt. I love baking with Greek yogurt. These muffins can be made with fresh or frozen peaches, making them a breakfast treat that will bring the taste of summer year round. 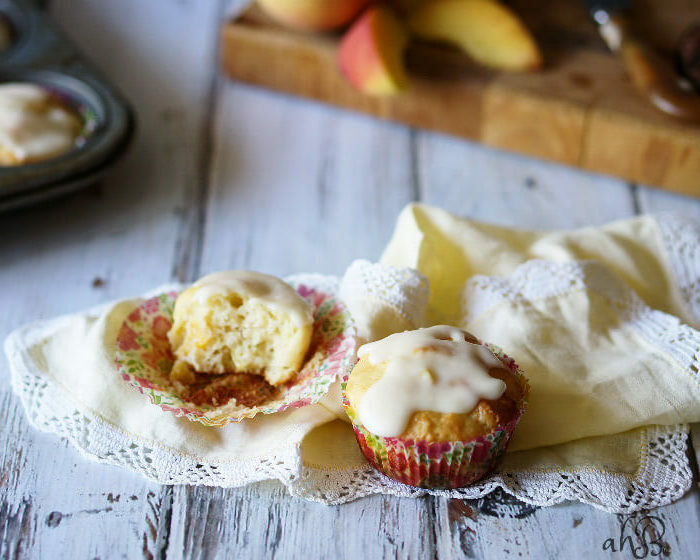 Peaches and cream muffins are full of baked peach and topped with a creamy vanilla glaze. Prepare a muffin tin with paper liners or grease with non-stick baking spray. In a medium sized mixing bowl, combine the dry ingredients and make a well in the center. In small bowl, beat the egg, then add in the yogurt and oil and blend well. Pour the egg and yogurt mixture into the flour and mix until just moistened. Fill the muffin cups 3/4 full and bake at 400 degrees for 20-23 minutes or until a toothpick inserted into the center of the muffin comes out clean. Cool for 5 minutes in the pan and then remove to a wire rack. To make the glaze, whisk together the melted butter, vanilla, milk and powdered sugar in small bowl until it it is smooth and lump free. Drizzle over the tops of the cooled muffins. Sounds delicious and I’m loving the addition of greek yogurt in these! I am loving that glaze on top of these muffins. Perfect with peaches! I agree! Peaches and cream is simply a classic. These look delicious and I can only imagine how wonderful they smell! Yummy! I am going to make these this weekend! Thanks for sharing! What a beautiful idea for cupcakes ~ I can’t wait for fresh peach season! Nice recipe 🙂 I love desserts with peaches! Thanks Daniela. I am too! And luckily there’s a really nice peach orchard not too far from me.